We loved this first look with Nina and her father! Nina and Greg got married in November of 2016! She got ready at the Hampton Inn in downtown Buffalo! She had one giant suite with two rooms to get ready in. We cleared out one side for a first look with dad. Mom and the bride were the only people in the room. Besides us taking the photos of course. I was hiding in the corner with my camera focused on the bride. Neal said he was going to cover dad's reaction. It was tight quarters, so we had to make sure we weren't in either persons image. Then there was the mirror! Neal actually moved out of the way of where he was originally standing to get this image. He got dad walking in and Nina in the mirror. I just loved this! Nina is out of focus, but you can still see that beautiful smile on her face. This was such an emotional moment. She held in the tears for a little bit, but once dad went up to her for a hug, they both let loose! Then we looked to mom and she was crying to! This is one reason why we like to keep first looks private. Even when we do them with the bride and groom. When there is a crowd of people, couples try to hold back their emotions. The wedding party can yell out and whistle and those intimate moments may not happen. This image is one of my favorite first looks with dad. 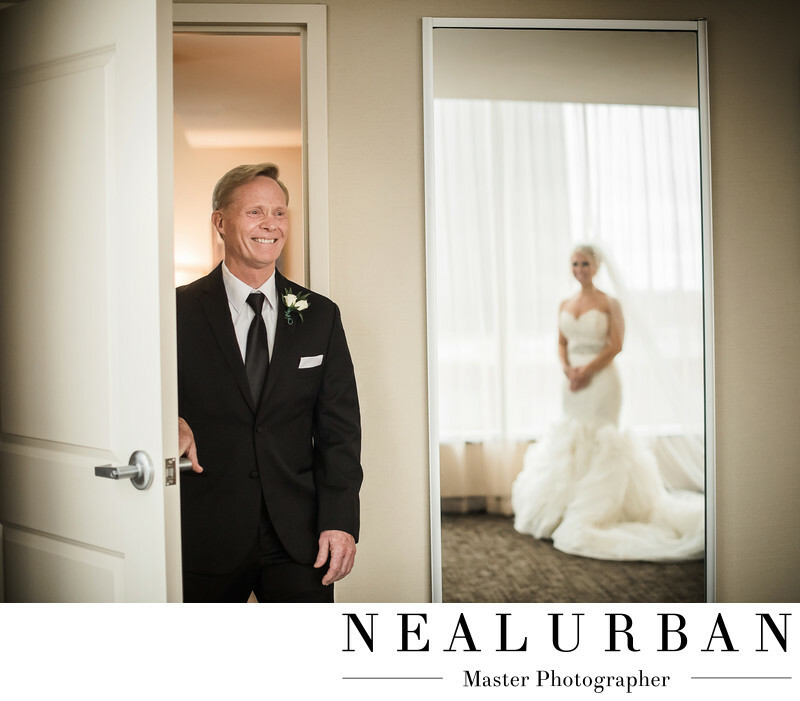 It was the first image we blogged about on nealurban.com when we started putting up their images! Location: 220 Delaware Ave. Buffalo, NY 14202 United States.